Adel H. Hanna D.D.S. and Jim Brady D.D.S. are committed to offering the most advanced technologies science and medicine have to offer. That tradition continues with a profoundly simple method to replace fillings; restore teeth that are decayed, weakened, and broken; and return your teeth to their natural strength and beauty. This tooth restoration solution is done with all-ceramic materials (not metal) that are compatible with the natural tissue in your mouth and is completed in just one appointment! Why go to the dentist a second time if you don't have to? During your appointment, Dr. Hanna or Dr. Brady will discuss the details of the procedure and answer any questions you may have. A thin layer of reflective powder will be applied to your tooth, and a special 3D imaging camera takes a photo of your tooth. Using the CEREC proprietary software, your restoration will be designed according to your tooth's appropriate form and function. 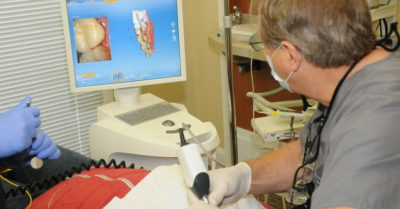 Then, CEREC will use diamond burs to create your restoration out of ceramic material. Finally, this ceramic piece is bonded to your tooth using state-of-the-art adhesive dentistry. Voilà! 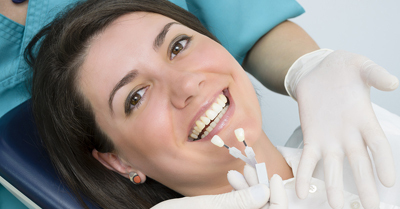 Your new ceramic tooth will look, feel, and remain as durable as a real tooth — without any of the discomfort, inconvenience, or unattractiveness of the traditional crowns used in decades past. It's part of ONE DAY and it's worth it! This works with your schedule and within your budget. You will be smiling when you leave our office!